Hole in the Day’s Bluff and Gravesite is a significant nationally and locally known landmark of great historic and scenic value. The site is located on a forested tract that includes both summits of a glacial moraine marked by knob and kettle typography. These summits offer outstanding scenic vistas of surrounding distant terrain, and are well documented as two historic sites: Chief Hole in the Day Gravesite and the “Lookout Place” of the Ojibway Indians. For 18 years I have independently researched the life of this Chief, and am pleased that the City of Little Falls is working to acquire this property with grant monies for a proposed park. Hole in the Day or “Pugonakeshig” (Hole in the Sky) was a nationally known Chief of the Ojibway Indians, and was buried on this site at his own request in 1847. Being the first Ojibway chief of that name, Hole in the Day was born around 1801 near Big Sandy Lake, and grew up in the region of Central Minnesota. He assumed joint leadership with his older brother Strong Ground over a vanguard band of Ojibway hunters and warriors located on lands contested with the Dakota Indians in 1825. He soon rose to prominence as a Chief through his adept dealing with whites over often touchy inter-tribal relations, while making substantial success in conquering hunting lands from the Dakota Indians in the 1820s and 1830s. During this time his band occupied several village sites in Morrison County along the Mississippi River. These were located near the Nokasippi, Little Elk, and Swan Rivers. Hole in the Day was chosen by his nation to be one of its main representatives during the 1837 Treaty negotiations, and was the first chief to sign that treaty. In 1838 and 1839, following several major conflicts with the Dakota, Hole in the Day began to be recognized by whites as the “Head Chief” of the Ojibway Nation, while his people saw him as only one of their more effective and leading statesmen. He was ranked above all other chiefs at the 1842 Treaty at La Pointe. With over 40 eagle feathers to his credit, he was, however, the driving force behind the 1843 Peace Treaty between the Ojibway and Dakota Indians. During the remainder of his life he continued to be the most well known and prominent Ojibway statesman, and was often the subject of nationally known magazine and newspaper articles. Hole in the Day met an accidental death in May, 1847, but one of his last requests was that he be buried on top of the bluff which has forever since carried his name. A government employee observed an American flag waving over the gravesite in 1848, and the site was noted by geologists in 1852 as the place where the Ojibway people commemorated his memory. The gravesite is still well known to many Ojibway Indians, and has been brought to national attention through several histories written about his people. Regionally, the site has been a well known local landmark that successive generations of Little Fallsians have grown up with. And with this site’s renown, grew the legend that if his grave remained undisturbed, his spirit would protect the area from tornadoes and severe storms. This myth has been current among locals for over 80 years and has foundation in Ojibway religious beliefs. In 1938, the Morrison County Historical Society placed a granite monument on the site of the south summit, while a defaced “1898 Mississippi River Commission” benchmark is still extant on the north summit. The south summit offers scenic vistas of the surrounding area, and the monument–of local black granite–has withstood the wrath of vandals. Incidentally, State and Federal Cemetery Acts supposedly protect these two summits from disturbances and development, but are hard to enforce. Both summits of the bluff were called the “Lookout Place” by Ojibway Indians. They utilized the site as a vantage point for keeping a lookout for Dakota Indians with whom they were often at war during the early historic period (1736 to 1860). This site is one of the few known or well documented locations in Minnesota that were used and named for this activity. An informal survey of the site revealed a pre-historic presence in the bluffs, hence the site has a long history of human use. Hole in the Day’s Bluff has long been used for recreational pursuits, with both an old and new network of hiking and skiing trails. The gravesite is located on private property and not accessible to the public without the landowner’s permission. Hopefully, the City will acquire this property for a park. With such well known historic value, Hole in the Day’s Bluff is an outstanding significant landmark which should be preserved for future generations. 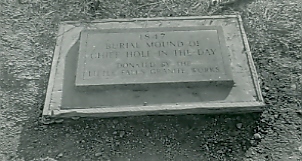 Hole-in-the-Day's marker, as placed by the Morrison County Historical Society and the Little Falls Granite Works in 1938. This marker was damaged by vandals in June 2006. Photo from the collections of the Morrison County Historical Society. I have not been able to find out where Hole in the Day’s Bluff is. Please give me direction on how to visit the site. Hi, Wanda – The bluff area, which is well known to locals, is located along Highway 371, just north of Little Falls. Unfortunately, you can’t visit the grave site. It’s on private property and the property owner is very particular about who is allowed to visit because he’s had so much difficulty with people being on the property as trespassers. The stone pictured above was smashed by vandals a few years ago. This is wonderful to see. Thank you so much. My husband would be a “cousin” to Hole-in-the-Day….the family splits with Broken Tooth. We are planning a family trip up there to hit many spots, and I know your museum will be one of them! Well, that was silly of me! I don’t suppose I needed to link to the booklet a second time in the comments, did I? Hi, Mary – I don’t know whether either lake got its name in memory of Chief Hole in the Day or if he lived at either lake. Actually, there were at least three Chiefs Hole in the Day. There was a father and son pair that were both chiefs within the area where the lakes are located. Both were incredibly influential within the Ojibwe tribe. I know more about these Chiefs Hole in the Day than the third one, who was unrelated to them. The father and son both set up their homes in various places in the region, with Chief Hole in the Day I living at the confluence of the Little Elk and Mississippi Rivers at one time. Chief Hole in the Day II spent a fair amount of time in the Brainerd Lakes/Crow Wing County area. Sorry I don’t have a more definite response for you, although I’m glad you shared your experiences with the lake. Hole-in-the-Day-II, the son of Hole-in-the-Day-I written about in this article, was murdered in 1868. Anton Treuer wrote a book about Hole-in-the-Day-the-Younger, and the events leading up to his killing. The book is titled, “The Assassination of Hole in the Day”. Hi, David – Thanks so much for your comment. We are aware of Anton Treuer’s book. In fact, we sell it in our gift shop and had Anton at a public event to discuss the book in 2010. The book is an excellent history of Hole-in-the-Day II, providing an analysis of events related to the assassination that I have not seen elsewhere. I recently found out my family can be traced back to Chief Hole-in-a-day the younger. I’m still learning as much as I can. Hi, Tim – Thanks for your comment. We have some family data for Chief Hole in the Day at the Weyerhaeuser Museum, so if you’re interested in seeing what we have, stop by sometime. We just recently found out that my husband’s 5X Great Grandmother was a niece to Chief Hole in the Day ( 1). She was married to James Allen Reed. She was baptized as “Marguerite Oskache Reed”, but went by Lizbeth. Would your family data for Chief Hole in the Day include information for her? Thank you! Hi, Susan – I checked our Reed Family File and found nothing on Marguerite/Lizbeth or James Allen. If that doesn’t help you find Marguerite/Lizbeth and you want us to do some formal research for you, send us an email and we’ll dig further. Is it true when they tried moving him a huge stormed happen of course Cheif pretty much saying thats where he wanted to be buried . Hi My name is John E Silk. I have just married a beautiful Russian Lady Angelina Silk! I am a great grandson of Chief Hole in Day! I wanted to teach my wife about my Indian Ancestry! Hi, John – Thanks for your comment and congratulations on your wedding! Another great history that covers Hole in the Day’s son, also called Hole in the Day, is Anton Treuer’s “The Assassination of Hole in the Day,” which you can find on Amazon here: https://www.amazon.com/Assassination-Hole-Day-Anton-Treuer/dp/0873518438. Those are good places to start in studying your family’s history. Both will lead you to additional resources within the citations. Hi Mary this is John and Angelina Silk, Thank you so much for your wishes and kind comment! we can not wait to learn more!